When it comes to providing a huge splash of summertime color to flowerbeds and landscapes, spring planted bulbs are the answer! Not only are they big on color, they are easy on long-term care. Spring planted bulbs require very little to plant and maintain, and their benefits go well beyond their pretty looks outside. They are also an excellent choice to grow and provide cut flowers for arrangements inside the home. In general, spring planted bulbs can go in the ground a few weeks before the last frost. The rule of thumb for many old-time gardeners is to plant at a depth 3 times of the bulb going in the ground, with the point facing up. Almost all flowering bulbs, whether planted in the fall or spring will perform best in fertile, well-drained soil. But beyond that, care is limited, and the rewards are many! Although there are many varieties to choose from, here are 2 excellent choices to plant, grow and provide beauty and interest in your flowerbeds this summer. One of the showiest spring planted bulbs of all, Gladiolus produce a sensational array of flowers on long spikes. They can provide a big burst of color when planted in small groups or in a mass plantings. Gladiolus are also perfect as a cut flower, providing loads of color and height to any flower arrangement. 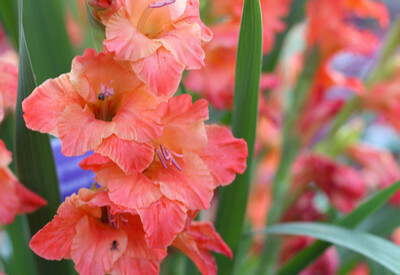 Glads are best planted in full sun to achieve their maximum color. They can survive in partial shade, but the blooms will be less dramatic. Plant bulbs a few weeks before the last frost date in your area, spacing 4 to 6″ apart. Gladiolus perform best in rich, fertile soil, so be sure to add in a healthy dose of compost in the planting hole. As they grow to full height, you can stake Gladiolus to keep blooms upright in the garden. 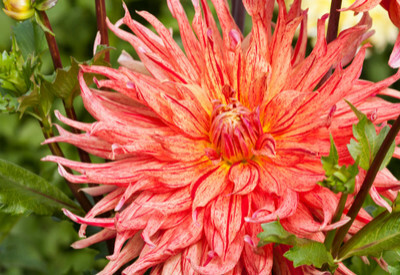 Dahlias are in reality a tuber, but are planted and grown like a bulb. Their incredibly large and beautiful blooms can instantly become the centerpiece of any landscape or flowerbed. Our favorite is the dinnerplate variety that as the name implies, have blooms that can be the size of a large dinner plate. Talk about a conversation piece! Although they require little work after planting, Dahlias do best when planted in rich, fertile soil with plenty of nutrients to provide power for their showy blooms. Be sure to use plenty of compost at planting time in and around the tubers, and on top as a mulch. Adding in a few tablespoons of an organic fertilizer such as worm castings will go a long way as well. As for when to put in the ground, plant Dahlias once the threat of frost has passed. Here is to planting a few summertime bulbs in your landscape this year! Jim and Mary. ← The Perfect Way To Plant Tomatoes – 5 Simple Steps To Success! Hi Ivy – In climates with harsh winters, they would not survive. If you have a mild winter climate than they most likely could make it over the winter to bloom the next year. Thank you so much Pam for the kind words. And we hope that you find the book very helpful when the snow melts away! why do you dig them up and re-plant them each year? Why can’t they stay in the ground as other perennials do? Your first photo in this article about Spring-planted bulbs is not Gladiolus but snapdragons! I had horrible, horrible problems with Japanese beetles on my dahlias last year. I so badly want to plant them again this summer but am not sure I will. If you have any suggestions for the beetles, I would love to hear them!!! Thanks, Mary and Jim! Hi there. I found your website on pinterest and ordered, and just received, your book. I love the way you have written it in very easy to understand steps. We are still having snowfall right at the moment, but as soon as possible I will put your ideas into practice. Thank you for sharing all your ideas, experiments, successes, failures, etc., with anyone interested in the same.